Canberra ( or ) is the capital city of Australia. With a population of 381,488, it is Australia's largest inland city and the eighth-largest city overall. The city is located at the northern end of the Australian Capital Territory (ACT), 280 km (170 mi) south-west of Sydney, and 660 km (410 mi) north-east of Melbourne. 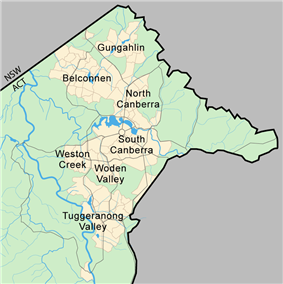 A resident of Canberra is known as a "Canberran". The city's design was influenced by the garden city movement and incorporates significant areas of natural vegetation that have earned Canberra the title of the "bush capital". The growth and development of Canberra were hindered by the World Wars and the Great Depression, which exacerbated a series of planning disputes and the ineffectiveness of a procession of bodies that were created in turn to oversee the development of the city. The national capital emerged as a thriving city after World War II, as Prime Minister Robert Menzies championed its development and the National Capital Development Commission was formed with executive powers. Although the Australian Capital Territory is now self-governing, the federal government retains some influence through the National Capital Authority. The word "Canberra" is popularly thought to derive from the word Kambera or Canberry which is claimed to mean "meeting place" in the old Ngunnawal language, one of several Indigenous languages spoken in the district by Aboriginal people before European settlers arrived. According to Ngunnawal Elder, Don Bell, the correct translation is "woman's breasts" and is the Indigenous name for the two mountains, Black Mountain and Mount Ainslie which lie almost opposite each other. In the 1860s, the name was reported by Queanbeyan newspaper owner John Gale to be an anglicisation of the indigenous name 'nganbra' or 'nganbira', meaning "hollow between a woman's breasts", and referring to the Sullivans Creek floodplain between Mount Ainslie and Black Mountain. Alternatively, R.H. Cambage in his 1919 book Notes on the Native Flora of New South Wales, Part X, the Federal Capital Territory noted that Joshua John Moore, the first settler in the region, named the area Canberry in 1823 stating that "there seems no doubt that the original was a native name, but its meaning is unknown." Survey plans of the district dated 1837 refer to the area as the Canberry Plain. In 1920, some of the older residents of the district claimed that the name was derived from the Australian Cranberry which grew abundantly in the area, noting that the local name for the plant was canberry. Although popularly pronounced or , the original pronunciation at its official naming in 1913 was . The district's change from a rural area in New South Wales to the national capital started during debates over Federation in the late 19th century. Following a long dispute over whether Sydney or Melbourne should be the national capital, a compromise was reached: the new capital would be built in New South Wales, so long as it was at least 100 miles (160 km) from Sydney, with Melbourne to be the temporary seat of government (but not referred to as the "capital") while the new capital was built. Newspaper proprietor John Gale circulated a pamphlet titled 'Dalgety or Canberra: Which?' advocating Canberra to every member of the Commonwealth's seven state and federal parliaments. By many accounts, it was decisive in the selection of Canberra as the site in 1908, as was a result of survey work done by the government surveyor Charles Scrivener. The NSW government ceded the Federal Capital Territory (as it was then known) to the federal government. In an international design competition conducted by the Department of Home Affairs, on 24 May 1911, the design by Walter Burley Griffin and Marion Mahony Griffin was chosen for the city, and in 1913 Griffin was appointed Federal Capital Director of Design and Construction and construction began. At midday on 12 March 1913, the city was officially given its name by Lady Denman, the wife of Governor-General Lord Denman, at a ceremony at Kurrajong Hill, which has since become Capital Hill and the site of the present Parliament House. Canberra Day is a public holiday observed in the ACT on the second Monday in March to celebrate the founding of Canberra. After the ceremony, bureaucratic disputes hindered Griffin's work; a Royal Commission in 1916 ruled his authority had been usurped by certain officials. Griffin's relationship with the Australian authorities was strained and a lack of funding meant that by the time he was fired in 1920, little work had been done. By this time, Griffin had revised his plan, overseen the earthworks of major avenues, and established the Glenloch Cork Plantation. 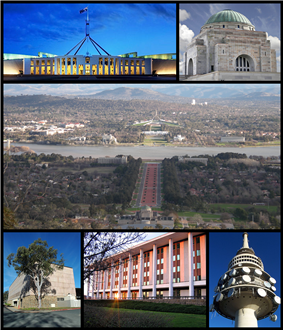 The federal legislature moved to Canberra on 9 May 1927, with the opening of the Provisional Parliament House. The Prime Minister, Stanley Bruce, had officially taken up residence in The Lodge a few days earlier. Planned development of the city slowed significantly during the depression of the 1930s and during World War II. Some projects planned for that time, including Roman Catholic and Anglican cathedrals, were never completed. Immediately after the end of the war, Canberra was criticised for resembling a village, and its disorganised collection of buildings was deemed ugly. Canberra was often derisively described as "several suburbs in search of a city". Prime Minister Robert Menzies regarded the state of the national capital as an embarrassment. Over time his attitude changed from one of contempt to that of championing its development. He fired two ministers charged with the development of the city for poor performance. Menzies remained in office for over a decade, and in that time the development of the capital sped up rapidly. The population grew by more than 50 per cent in every five-year period from 1955 to 1975. Several Government departments, together with public servants, were moved to Canberra from Melbourne following the war. Government housing projects were undertaken to accommodate the city's growing population. The newly built Reid, Braddon, Curtin, Chifley and Parkes. On 27 January 1972 the Aboriginal Tent Embassy was first established by indigenous people on the grounds of Parliament House; it was created to draw attention to Indigenous rights and land issues and has been continuously occupied since 1992. On 9 May 1988, a larger and permanent Parliament House was opened on Capital Hill as part of Australia's bicentenary celebrations, and the Federal Parliament moved there from the Provisional Parliament House, now known as Old Parliament House. Canberra has a relatively dry continental climate with warm to hot summers and cool to cold winters, under Köppen-Geiger classification it has an oceanic climate (Cfb). Canberra experiences warm, generally dry summers, and chilly winters with heavy fog and frequent frosts. Snow is rare in the CBD (central business district), but the surrounding areas get annual snowfall through winter and often the snow-capped mountains can be seen from the CBD—the last significant snowfall in the city centre was in 1968. The highest recorded maximum temperature is variously reported as 42.2 °C (108.0 °F) on 1 February 1968, or as 42.8 °C (109.0 °F) at Acton on 11 January 1939. The lowest recorded minimum temperature was −10.0 °C (14.0 °F) on 11 July 1971. Light snow falls only once or twice per year, and it is usually not widespread and quickly dissipates. Canberra is protected from the west by the Brindabellas which create a slight rain shadow in Canberra's valleys. The Griffins assigned spiritual values to Mount Ainslie, Black Mountain, and Red Hill and originally planned to cover each of these in flowers. That way each hill would be covered with a single, primary color which represented its spiritual value. This part of their plan never came to fruition, as World War I slowed construction and planning disputes led to Walter's dismissal by Prime Minister Billy Hughes after the war ended. The Chief Minister is elected by the Members of the Legislative Assembly (MLA) and selects colleagues to serve as ministers alongside him or her in the Executive, known informally as the cabinet. Whereas the ACT has federally been dominated by Labor, the Liberals have been able to gain some footing in the ACT Legislative Assembly, and were in government for just over eight of the Assembly's 25-year history, mostly during a period of six and half years from 1995 and 2001, when Labor won power. At the 2004 election the Australian Labor Party, headed by then Chief Minister Jon Stanhope, won nine of the 17 seats and formed the ACT's first majority government, but after the 2008 election was forced into minority government with the Greens. As almost all of the ACT's population lives in Canberra, political trends for both areas are closely aligned. The ACT was given its first federal parliamentary representation in 1949, when it gained a seat in the House of Representatives, the Division of Australian Capital Territory. The ACT member could only vote on matters directly affecting the territory. In 1974, the ACT was allocated two Senate seats. In 1974, the House of Representatives seat was divided into two. A third was created in 1996, but was abolished in 1998 because of changes to the regional demographic distribution. Both House of Representatives seats have mostly been held by Labor, usually by comfortable margins. The Labor Party has polled at least seven percentage points more than the Liberal Party at every federal election since 1990, and their average lead since then has been 15 percentage points. The ALP and the Liberal Party have always held one Senate seat each. The Australian Federal Police (AFP) provides all of the constabulary services in the territory in a manner similar to state police forces, under a contractual agreement with the ACT Government. The AFP does so through its community policing arm, ACT Policing (Australian Capital Territory Police). People who have been charged with offences are tried either in the ACT Magistrates Court or for more severe offences, the ACT Supreme Court. Prior to its closure in 2009, prisoners were held in remand at the Belconnen Remand Centre in the ACT but usually jailed in New South Wales. 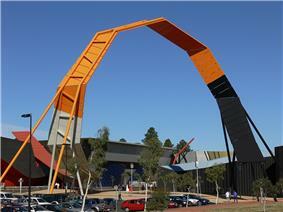 The Alexander Maconochie Centre was officially opened on 11 September 2008 by then Chief Minister Jon Stanhope. The total cost for construction was $130 million. Courts such as a Small Claims Tribunal and a Family Court exist for civil law actions and other non-criminal legal matters. The median house price in Canberra as of September 2009 was $511,820, lower than only Sydney among capital cities of more than 100,000 people, having surpassed Melbourne and Perth since 2005. The median weekly rent paid by Canberra residents is higher than rents in all other states and territories. As at January 2014 the median unit rent in Canberra was $410 per week and median housing rent was $460, making the city the third most expensive in the country. Factors contributing to this higher weekly rental market include; higher average weekly incomes, restricted land supply, and inflationary clauses in the ACT Residential Tenancies Act. The former RAAF Fairbairn, adjacent to the Canberra International Airport was sold to the operators of the Airport, but the base continues to be used for RAAF VIP flights. A growing number of software vendors have based themselves in Canberra, to capitalise on the concentration of government customers; these include Tower Software and RuleBurst. A consortium of private and government investors is currently making plans for a billion-dollar data hub, with the aim of making Canberra a leading centre of such activity in the Asia-Pacific region. In 2012 the ACT Government legislated greenhouse gas targets to reduce its emissions by 40 per cent from 1990 levels by 2020, 80 per cent by 2050, with no net emissions by 2060. The government announced in 2013 a target for 90% of electricity consumed in the ACT to be supplied from renewable sources by 2020. In 1996 Canberra was the first city in the world to set a vision of no waste by 2010. The strategy aimed to achieve a waste-free society by 2010, through the combined efforts of industry, government and community. By early 2010, it was apparent that the ACT Government initiative had failed. Of all waste produced in the ACT, 75 per cent is recycled. Average household food waste in the ACT is above the Australian average, costing an average $641 per household per annum. The average Canberran was responsible for 13.7 tonnes of greenhouse gases in 2005. As of 2012 the most common crimes in the ACT are property related crimes, unlawful entry with intent and motor vehicle theft. They affected 2,386 and 968 people (637 and 258 per 100,000 persons respectively). Homicide and related offences—murder, attempted murder and manslaughter, but excluding driving causing death and conspiracy to murder—affect 1.6 per 100,000 persons, which is below the national average of 2.0 per 100,000. Rates of assault and sexual assault (60.2 per 100,000 persons) are also below the national average (80.2 per 100,000). 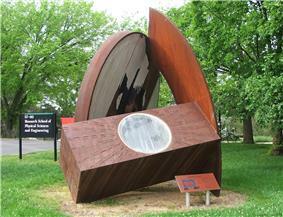 A homopolar generator, constructed by Mark Oliphant in the 1950s at the ANU College of Physical & Mathematical Sciences. The Australian Defence Force Academy (ADFA) and the Royal Military College, Duntroon are located in the inner-northern suburb of Campbell. ADFA teaches military undergraduates and postgraduates and includes UNSW@ADFA, a campus of the University of New South Wales; Duntroon provides Australian Army officer training. Tertiary level vocational education is also available through the multi-campus Canberra Institute of Technology. In February 2004 there were 140 schools in Canberra; 96 were operated by the government and 44 were private. During 2006, the ACT Government announced closures of up to 39 schools, to take effect from the end of the school year, and after a series of consultations unveiled its Towards 2020: Renewing Our Schools policy. As a result, some schools closed during the 2006–08 period, while others were merged; the creation of combined primary and secondary government schools will proceed over the next decade. The new policy has provoked significant opposition. Most suburbs are planned to include a primary and a nearby preschool; these are usually located near open areas where recreational and sporting activities are easily available. Canberra has the highest percentage of non-government (private) school students in Australia, accounting for 40.6 per cent of ACT enrollments. 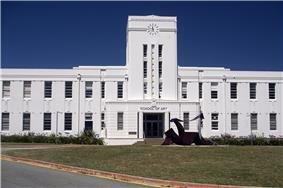 The Canberra Museum and Gallery in the city is a repository of local history and art, housing a permanent collection and visiting exhibitions. Several historic homes are open to the public: Lanyon and Tuggeranong Homesteads in the Tuggeranong Valley, Mugga-Mugga in Symonston, and Blundells' Cottage in Parkes all display the lifestyle of the early European settlers. 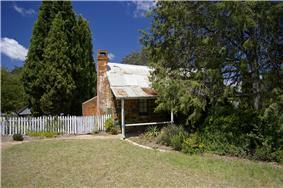 Calthorpes' House in Red Hill is a well preserved example of a 1920s house from Canberra's very early days. Canberra has many venues for live music and theatre: the Canberra Theatre and Playhouse which hosts many major concerts and productions; and Llewellyn Hall (within the ANU School of Music), a world-class concert hall are two of the most notable. The Street Theatre is a venue with less mainstream offerings. The Albert Hall was the city's first performing arts venue, opened in 1928. It was the original performance venue for theatre groups such as the Canberra Repertory Society. Stonefest at the University of Canberra was a large two-day music festival. There are numerous bars and nightclubs which also offer live entertainment, particularly concentrated in the areas of Dickson, Kingston and the city. Most town centres have facilities for a community theatre and a cinema, and they all have a library. Popular cultural events include the National Folk Festival, the Royal Canberra Show, the Summernats car festival, Enlighten festival, the National Multicultural Festival in February and the Celebrate Canberra festival held over 10 days in March in conjunction with Canberra Day. As Australia's capital, Canberra is the most important centre for much of Australia's political reportage and thus all the major media, including the press gallery", a group of journalists who report on the national parliament. The National Press Club of Australia in Barton has regular television broadcasts of its lunches at which a prominent guest, typically a politician or other public figure, delivers a speech followed by a question-and-answer session. Prior to 1989, Canberra was serviced by just the ABC, SBS and Capital Television (CTC), which later became Southern Cross Ten, with Prime7 and WIN Television arriving as part of the Government's regional aggregation programme in that year. A DAB+ digital radio trial is also currently in operation, it simulcasts some of the AM/FM stations, and also provides several digital only stations (DAB+ Trial Listing). In addition to local sporting leagues, Canberra has a number of sporting teams that compete in national and international competitions. The best known teams are the Canberra Raiders and the Brumbies who play rugby league and rugby union respectively; both have been champions of their leagues. Both teams play their home games at Canberra Stadium, which is the city's largest stadium and was used to hold group matches in soccer for the 2000 Summer Olympics and in rugby union for the 2003 Rugby World Cup. The city also has a successful basketball team, the Canberra Capitals, which has won seven out of the last eleven national women's basketball titles. Canberra United FC represents the city in the W-League, the national women's association football league, and were champions in the 2011–12 season. Expansion AFL club Greater Western Sydney Giants commenced a partnership with Canberra in 2012 will play three home games at Manuka Oval each season until at least 2021. Prior to this the Melbourne based AFL team the Kangaroos played some home games at Manuka Oval until July 2006. Following the move of the Kangaroos' alternative home ground to Carrara in Queensland, Melbourne and the Western Bulldogs played some home games at Manuka Oval from 2007 against the Sydney Swans. Canberra is also home to the Barassi International Australian Football Youth Tournament. The historic Prime Minister's XI cricket match is played at Manuka Oval annually. Other significant annual sporting events include the Canberra Marathon and the City of Canberra Half Ironman Triathlon. Canberra has numerous sporting ovals, golf courses, skate parks, and swimming pools that are open to the public. Tennis courts include those at the National Sports Club, Lyneham, former home of the Canberra Women's Tennis Classic. A Canberra-wide series of bicycle paths are available to cyclists for recreational and sporting purposes. Canberra Nature Parks have a large range of walking paths, horse and mountain bike trails. Water sports like sailing, rowing, dragon boating and water skiing are held on Canberra's lakes. The Rally of Canberra is an annual motor sport event and a facility for drag racing is currently being planned for construction. ACTION, the government-operated bus service, provides public transport throughout the city. Deane's Transit Group provides bus services between Canberra and nearby areas of New South Wales through their Transborder Express (Murrumbateman and Yass) and Deane's Buslines (Queanbeyan) brands. In the 2011 census, 6.7% of the journeys to work involved public transport; with 6.5% walking or cycling to work. There are two local taxi companies. Aerial Capital Group enjoyed monopoly status until the arrival of Cabxpress in 2007. An interstate NSW TrainLink railway service connects Canberra to Sydney. 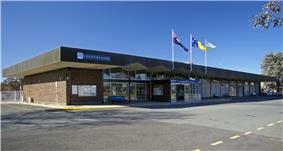 Canberra's railway station is in the inner south suburb of Kingston. Between 1920 and 1922 the train line crossed the Molonglo River and ran as far north as the city centre, although the line was closed following major flooding and was never rebuilt, while plans for a line to Yass were abandoned. A 3 ft 6 in (1,067 mm) gauge construction railway was built in 1923 between the Yarralumla brickworks and the provisional Parliament House; it was later extended to Civic, but the whole line was closed in May 1927. Train services to Melbourne are provided by way of a NSW TrainLink bus service which connects with a rail service between Sydney and Melbourne in Yass, about a one hour drive from Canberra. Canberra International Airport provides direct domestic services to Sydney, Melbourne, Brisbane, Adelaide, Gold Coast and Perth, with connections to other domestic centres. There are direct daily flights to Albury and Newcastle in New South Wales. No regular commercial international flights operate from the airport. Canberra Airport is, as of September 2013, designated by the Australian Government Department of Infrastructure and Regional Development as a restricted use designated international airport. Until 2003 the civilian airport shared runways with RAAF Base Fairbairn. In June of that year, the Air Force base was decommissioned and from that time the airport was fully under civilian control. 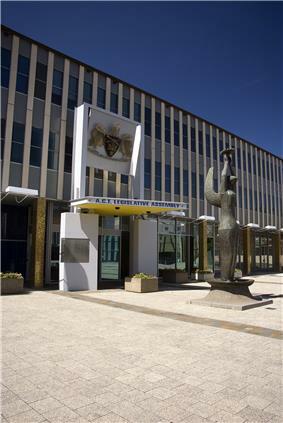 The government-owned ACTEW Corporation manages Canberra's water and sewerage infrastructure.ActewAGL is a joint venture between ACTEW and AGL, and is the retail provider of Canberra's utility services including water, natural gas, electricity, and also some telecommunications services via a subsidiary TransACT. Electricity for Canberra mainly comes from the national power grid through substations at Holt and Fyshwick (via Queanbeyan). Power was first supplied from a thermal plant built in 1913, near the Molonglo River, but this was finally closed in 1957. A 20 megawatt photovoltaic solar plant, described as the largest photovoltaic solar farm in Australia, was officially opened at Royalla on 3 September 2014. Planning approval is being sought for the 7 megawatt OneSun Capital solar farm at Uriarra and the 13 megawatt Mugga Lane Solar Park at Hume. In addition numerous houses in Canberra have photovoltaic panels and/or solar hot water systems. Some limited local renewable power is produced via a hydro generator on the main water supply pipeline for Canberra at Mount Stromlo and methane plants at waste landfill sites at Belconnen and Mugga Lane. There are currently no wind-power generators in Canberra, but several have been built or are being built or planned in nearby New South Wales, such as the 140.7 megawatt Capital Wind Farm. The ACT government announced in 2013 that it was raising the target for electricity consumed in the ACT to be supplied from renewable sources to 90% by 2020. This will raise the target from 210 to 550 megawatts. The ACT government announced in 2014 that up to 23 megawatts of feed-in-tariff entitlements would be made available for the establishment of a facility in the ACT or surrounding region for burning household and business waste to produce electricity by 2020. The ACT has the highest rate of home computer access (88 per cent of households) and broadband internet connection (74 per cent of households) in Australia. ^ "3218.0 - Regional Population Growth, Australia, 2012–13: ESTIMATED RESIDENT POPULATION, States and Territories - Greater Capital City Statistical Areas (GCCSAs)". ERP at 30 June 2013. ^ "3218.0 - Regional Population Growth, Australia, 2012". ^ a b "Planning Data Statistics". ^ Macquarie ABC Dictionary. The Macquarie Library. 2003. p. 144. ^ a b Frei, Patricia. "'"Discussion on the Meaning of 'Canberra. Canberra History Web. Patricia Frei. Archived from the original on 27 September 2013. Retrieved 11 August 2013. ^ Hull, Crispin. "European settlement and the naming of Canberra". Canberra – Australia’s National Capital. Crispin Hull. Retrieved 7 June 2010. ^ Gillespie, Lyall (1984). Aborigines of the Canberra Region. Canberra: Wizard (Lyall Gillespie). pp. 1–25. ^ "The Royal Military College, Duntroon". Defence Housing Australia. p. 81. Archived from the original on 18 March 2012. Retrieved 13 May 2010. ^ a b c Sparke 1988, p. 116. ^ a b c d e "Canberra – Australia's capital city". Department of the Environment, Water, Heritage and the Arts. 4 February 2010. Archived from the original on 14 May 2011. Retrieved 23 April 2010. ^ Davison, Graeme; Hirst, John; Macintyre, Stuart, eds. (1998). The Oxford Companion to Australian History. Oxford University Press. pp. 464–465, 662–663. ^ a b c d "History of the NCA". National Capital Authority. 11 June 2009. Archived from the original on 12 February 2014. Retrieved 26 February 2010. ^ "Ethel Bruce – Stanley Melbourne Bruce – Australia's PMs – Australia's Prime Ministers". ^ a b "Role of the Assembly". ^ a b c d e f "Past Election Results". Australian Broadcasting Corporation. Retrieved 13 January 2010. ^ Jerga, Josh (3 December 2009). "NSW boasts first female leadership team". The Sydney Morning Herald (Fairfax Media). Archived from the original on 15 May 2012. Retrieved 13 January 2010. ^ Doogan, Maria (December 2006). The Canberra Firestorm: Inquests and inquiry into four deaths and four fires between 8 and 18 January 2003 1. Canberra: ACT Coroners Court. Retrieved 7 June 2010. ^ "About the Centenary of Canberra". Centenary of Canberra unit - ACT Government. Retrieved 8 February 2013. ^ a b c d e f g h i "Climate of Canberra Area". ^ "Lady luck or lucky lady?". ^ "Canberra Nature Park: Mt Majura Nature Reserve". ACT Government Territory and Municipal Services. 2004. Archived from the original on 26 March 2012. Retrieved 13 May 2010. ^ "Canberra Nature Park: Mt Taylor Nature Reserve". ACT Government Territory and Municipal Services. 2004. Archived from the original on 1 May 2013. Retrieved 24 Feb 2013. ^ "Canberra Nature Park: Mt Ainslie Nature Reserve". ACT Government Territory and Municipal Services. 2004. Archived from the original on 1 May 2013. Retrieved 24 Feb 2013. ^ "Canberra Nature Park: Mt Mugga Mugga Nature Reserve". ACT Government Territory and Municipal Services. 2004. Archived from the original on 1 May 2013. Retrieved 24 Feb 2013. ^ "Canberra Nature Park: Black Mountain Nature Reserve". ACT Government Territory and Municipal Services. 2004. Archived from the original on 1 May 2013. Retrieved 24 Feb 2013. ^ McLeod, Ron (2003). Inquiry into the Operational Response to the January 2003 Bushfires in the ACT. Canberra, ACT. ^ "Lake Ginninderra". ACT Government Territory and Municipal Services. Retrieved 17 September 2013. ^ "Climate: Canberra - Climate graph, Temperature graph, Climate table". Climate-Data.org. Retrieved 5 September 2013. ^ "1301.0 - Year Book Australia, 2002". Australian Bureau of Statistics. 25 January 2002. Archived from the original on 12 October 2012. ^ "Australia – Climate of Our Continent". ^ "Climate information for Canberra Aero". ^ "Climate statistics for Australian locations: Canberra Airport Comparison". "Special climate statement 36 – Unseasonal cold in southeast Australia". Bureau of Meteorology. 13 January 2012. Retrieved 4 September 2014. ^ "Timeline Entries for William Morris Hughes". ^ "About Weston Creek, Canberra". Weston Creek Community Council. Retrieved 23 April 2010. 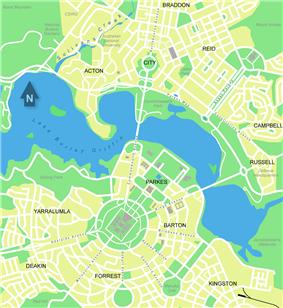 ^ a b c d e f "Lake Burley Griffin Interactive Map". ^ "How to cut through the ACT's planning thicket". ^ a b "Place name processes". ^ "Diplomatic and Consular Premises – Protocol Guidelines". ^ Johnston, Dorothy (September 2000). "Cyberspace and Canberra Crime Fiction". Australian Humanities Review. Retrieved 13 May 2010. ^ "Election Summary". Australian Broadcasting Corporation. Retrieved 13 January 2010. ^ a b "ACT Representation (House of Representatives) Act 1974 (Cth)". ^ "Senate – A.C.T.". Australian Broadcasting Corporation. 6 November 2007. Retrieved 31 January 2010. ^ a b "Administration of National Land". ^ "Maintenance and Operation of Assets". ^ "Australian Capital Territory (Self-Government) Act 1988". ^ "Australian Capital Territory (Self-Government) Act 1988. Schedule 4". ^ "History of the Court of Appeal and the Supreme Court". The Supreme Court of the ACT. Retrieved 7 March 2014. ^ "1367.0 State and Territory Statistical Indicators - Unemplyment rate: ABS". ^ "6302.0 - Average Weekly Earnings, Australia, May 2013". ^ "It’s official: the property market has cooled". Real Estate Institute of Australia. 9 September 2010. Archived from the original on 19 July 2008. Retrieved 7 June 2010. ^ January 2004&Latest "Census of Population and Housing Australia in Profile A Regional Analysis". ^ Clisby, Meredith (16 January 2014). "ACT still expensive place to live despite fall in rent prices". The Canberra Times (Fairfax Media). Archived from the original on 8 March 2014. ^ "Gross State Product 2011–12". ACT Government Chief Minister and Treasury Directorate, Economics Branch. 21 November 2012. Archived from the original on 30 July 2013. Retrieved 17 September 2013. ^ "Industry of employment by place of work". ACT Government Chief Minister and Treasury Directorate. 28 June 2013. Retrieved 17 September 2013. 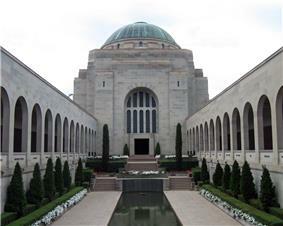 ^ "Fairbairn: Australian War Memorial". ^ Sutherland, Tracy (15 January 2007). "USFTA begins to reap results". ^ a b c d "ACT sets 90% renewable energy target in law" (Press release). ^ "Zero waste". Residua. September 2001. Archived from the original on 18 November 2011. ^ Lauer, Sandra (23 May 2007). "Reducing commercial waste going to landfill in Canberra by improving the waste management practices of micro businesses". ACT Government. Archived from the original on 19 May 2013. ^ Nash, Lucy (18 January 2010). "No waste 2010=some waste 2010". 666 ABC Canberra. ^ Pryor, Penny (30 October 2011). "Saving money can help save others". The Canberra Times (Fairfax Media). Archived from the original on 4 June 2012. ^ "2006 Census QuickStats : Canberra (Statistical Division)". ^ "Australian Demographic Statistics, Dec 2002". ^ "Sweet charity: territory leads in giving". The Canberra Times (Fairfax Media). 4 November 2013. Archived from the original on 4 November 2013. ^ "6227.0.55.003 - Education and Work, Australia - Additional data cubes, May 2013". ^ "4510.0 - Recorded Crime - Victims, Australia, 2012". ^ "3101.0 - Australian Demographic Statistics, Jun 2012". ^ "The Big Machine". Australian National University. Retrieved 6 April 2013. ^ a b "Australian National University". ^ "Academic Ranking of World Universities 2004". Institute of Higher Education, Shanghai Jiao Tong University. 2004. Archived from the original on 27 November 2007. Retrieved 13 May 2010. ^ "Canberra School of Theology". ^ "'"School closures report 'doesn't go far enough. Australian Broadcasting Corporation. 18 September 2009. Archived from the original on 31 January 2010. Retrieved 13 May 2010. ^ Macdonald, Emma (8 May 2013). "Public schools win young, but lose seniors". The Canberra Times (Fairfax Media). Archived from the original on 28 February 2014. ^ "Locations and opening hours". ^ "Visiting the High Court". ^ "Outdoor and Nature". Visit Canberra. Retrieved 23 April 2010. ^ "Lanyon". ACT Museums and Galleries. Retrieved 13 May 2010. ^ "Minders of Tuggeranong Homestead". ^ "Mugga-Mugga". ACT Museums and Galleries. Retrieved 13 May 2010. ^ "Calthorpes' House". ACT Museums and Galleries. Retrieved 13 May 2010. ^ Atkinson, Ann; Knight, Linsay; McPhee, Margaret (1996). The Dictionary of Performing Arts in Australia: Opera, Dance, Music. Allen & Unwin. pp. 46–47. ^ a b Daly, Margo (2003). Rough Guide to Australia. Rough Guides. p. 67. ^ a b Vaisutis 2009, p. 278. ^ a b c "Canberra's international relationships". ^ "Canberra Nara Park". ACT Government Territory and Municipal Services. 9 October 1999. Archived from the original on 18 February 2014. Retrieved 17 September 2013. ^ "Speaker archive". National Press Club of Australia. Retrieved 13 May 2010. ^ "Bills Digest No. 132 2001–02: Broadcasting Services Amendment (Media Ownership) Bill 2002". ^ "BMA comes of age". ABC. 24 March 2013. Archived from the original on 7 October 2013. ^ "Brumbies Crowned Super 12 Champions.". ^ "Canberra downs Roar to clinch W-League title". ^ "Who Rules, Aussie Rules!". ^ "Boating on Lake Burley Griffin". ^ "Canberra Dragway Frequently Asked Questions" (PDF). ACT Government. 21 February 2006. Archived from the original on 10 April 2012. Retrieved 8 October 2007. 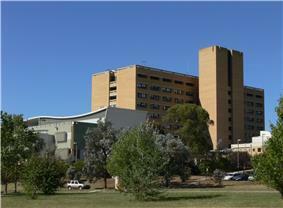 ^ "Canberra Hospital". ACT Health. Retrieved 23 April 2010. ^ Cronin, Fiona (12 August 2008). "Chemo crisis to hit ACT patients". ^ "15 years since hospital implosion tragedy". The Canberra Times (Fairfax Media). 13 July 2012. Archived from the original on 14 July 2012. Retrieved 25 September 2013. ^ Reynolds, Fiona (5 November 1999). "Increasing pressure on ACT Chief Minister". A.M. (Australian Broadcasting Corporation). Archived from the original on 4 November 2012. Retrieved 2 June 2009. ^ "About Emergency". ACT Government Health Information. Retrieved 23 April 2010. ^ a b "Canberra's transport system" (PDF). ^ "Survey shows speeding at disputed camera site". ^ a b Lawson, Kirsten (11 March 2014). "Impact of traffic cameras on speed put under microscope". The Canberra Times (Fairfax Media). Archived from the original on 11 March 2014. ^ "Taxi company 'not concerned' at losing monopoly". Australian Broadcasting Corporation. 3 February 2007. Archived from the original on 18 February 2012. ^ Hogan, Richard (July 2003). "Farewell to Fairbairn". Air Force (Royal Australian Air Force) 45 (12). ^ Thistleton, John (25 June 2014). "Cycling campaign group Pedal Power slams ACT government on injury rates". The Canberra Times (Fairfax Media). Archived from the original on 25 June 2014. ^ "Royalla Solar Farm - ACCIONA Energy to commence construction". Acciona. 2 September 2013. Retrieved 20 April 2014. ^ "Fyshwick Sewage Treatment Plant". 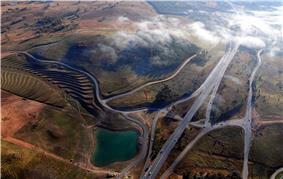 ^ "Lower Molonglo Water Quality Control Centre". ActewAGL. Retrieved 25 February 2014. ^ Independent Competition and Regulatory Commission (October 2003). "Review of Contestable Electricity Infrastructure Workshop" (PDF). p. 13. Archived from the original on 20 April 2013. Retrieved 10 May 2010. ^ "20048. 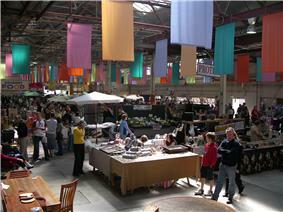 Kingston Powerhouse Historic Precinct (Entry to the ACT Heritage Register)". ACT Heritage Council. Retrieved 11 October 2014. ^ "Australia's largest solar farm opens in the ACT" (Press release). ^ "Royalla Solar Farm". Fotowatio Renewable Ventures. Retrieved 11 October 2014. ^ "OneSun Capital". OneSun Capital. Retrieved 7 March 2014. ^ "Uriarra residents fail to heritage list village, stop solar farm". ^ "Mugga Lane Solar Park". Zhenfa Australia. Retrieved 7 March 2014. ^ "$5m solar farm plan for data hub site". ^ "Open the floodgates... Hydroelectricity". ActewAGL. Retrieved 25 February 2014. ^ "Renewable gas sources". ActewAGL. Retrieved 25 February 2014. ^ "Large scale feed-in tariff law expanded to meet 90% renewables target" (Press release). ^ "Turning waste into energy" (Press release). ^ "1301.0 - Year Book Australia, 2009–10 USE OF INFORMATION TECHNOLOGY (IT)". Australian Bureau of Statistics (25 January 1963). "The Australian Capital Territory, Canberra the National Capital: Fifty Years of Development". Year Book Australia (Australian Bureau of Statistics). Archived from the original on 4 June 2011. Lake Burley Griffin, Canberra: Policy Plan. Canberra: National Capital Development Commission. 1988. The Penguin Australia Road Atlas. Ringwood, Victoria: Penguin Books Australia. 2000. UBD Canberra. North Ryde, New South Wales: Universal Publishers. 2007. Gibbney, Jim (1988). Canberra 1913–1953. Canberra: Australian Government Publishing Service. Gillespie, Lyall (1991). Canberra 1820–1913. Canberra: Australian Government Publishing Service. Sparke, Eric (1988). Canberra 1954–1980. Canberra: Australian Government Publishing Service. Vaisutis, Justine (2009). Australia. Footscray, Victoria: Lonely Planet. Wigmore, Lionel (1971). Canberra: History of Australia's National Capital. Canberra: Dalton Publishing Company. Williams, Dudley (2006). The Biology of Temporary Waters. Oxford: Oxford University Press.